After a bit of thought, I find myself tackling another film by the prominent German filmmaker, Werner Herzog. Only this time Herzog’s documentary shows man’s apathy towards nature. However, through his poetic style he is able to capture moments of beauty where this simple idea seemed to have been extinguished long before. 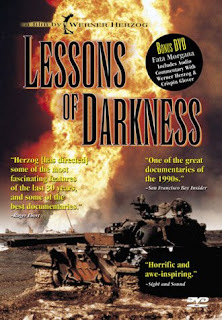 There is a romantic aspect to what Herzog is showing his audience in Lessons of Darkness. It is interesting, yet calming that we can find solace in an otherwise horrid situation. Fire, man’s tool with a life of its own. This film was released in 1992, showing the immediate aftermath of the Gulf War in Kuwait. Although, you wouldn’t necessarily know that by watching the film. Herzog makes no mention of the war, Kuwait, or reason. His context is in the visuals, creating an identity for this film. His voice is of a visitor to Earth, trying to feel and understand the ways of men. Therefore, he does not takes sides when it comes to the different groups of men involved. Rather, his viewpoint incapsulates all men as a species. Herzog’s poetic style really comes to life as he grasps the footage of ruins and burning oil fields left behind. There is a lot of emphasis given to the burning oil fields in Kuwait, but my eye turned to the ruins. I was captivated by the sheer loneliness left in the wake of the destruction. The way Herzog filmed the landscapes left me perplexed and at the same time soothed. A part of me may have felt some guilt, but above all I just wanted to see more. Maybe my intrigue stems from man’s thirst for destruction. Maybe. However, I like to point my captivation to a deeper ideology. One that romanticizes the absence of man. How still everything looked. Peaceful. Untouched only after war. This film utilizes Herzog’s dreary accent throughout its entirety. That may be one of the few hiccups in this documentary. You may learn a thing or two by watching this film, but the real benefit lies in the experience. Running only 50 minutes doesn’t hurt either. Check it out. You may share my opinion. You may not. For you film students, this isn’t a bad one to put on your intellectual resume.